Lonnie Wayne Isabell, born in Nashville, TN on September 23, 1952. He passed away on May 19, 2018. He was preceded in death by his granddaughter, Sadie, and his brother Tommy Overton. He is survived by his wife of 39 years, Patty Isabell; his daughter, Jessica (Ryan Hughes) Isabell; his son, Rocky (Krystal) Isabell; his grandchildren, Shannon, Elijah, Jaden, Shalyn, Karleigh, Jayce, and Kayleigh. Wayne recently retired from U.S. Smokeless Tobacco in Nashville after 27 years of service. 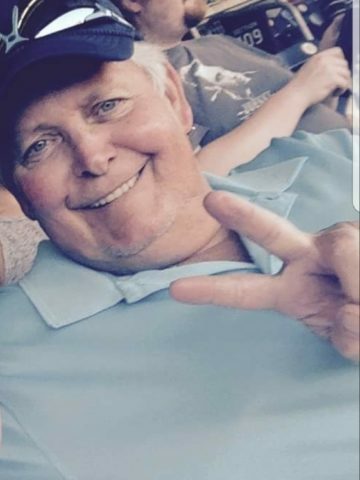 He loved golfing, and spending time with his family. Visitation will be at Cole & Garrett Funeral Home, Goodlettsville Monday from 4-8 pm. Celebration of life service will be on Tuesday May 22, 2018 at 4 pm with visitation one hour prior to service time. Another good man gone too soon for the ones left behind. Continued prayers for the family. My thoughts and prayers are with the Isabell family. He was a great man! May God wrap his arms around y’all at this time! I love you Dad! I miss you so much. I thought my world ended when you died. I was wrong, it is missing you that has destroyed it. Oh yeah Ryan and I got married. Such a good man, husband, and father. He will be missed dearly. He was a good man known him since I was very young.He’s earned his wings. I had the privilege of working with Wayne for a number of years at the tobacco company. I had tremendous respect for him as an employee and as a friend. He will be missed but not forgotten. I enjoyed working and getting to know Wayne the past 14 years. He helped everyone that asked for help and will truly be missed by many. He enjoyed his yearly Florida trips and UST golf outings with his coworkers. His UST family sends out their condolences to his family and friends during this difficult time. Rest In Peace my friend. Praying for comfort for the family! May God richly bless and keep you! I pray for God’s comforting arms to surround you all during this difficult time in your life. I also pray for peace for you knowing Wayne is no longer suffering. He and Dad will hit the l inks in heaven. I know rocky since .1972 .they lived in Small house back side of Oscar Mayer’s meat . He a good guy Bless his heart .hope someone contact,s Jim Raymer . To all whom have commented, family is overwhelmed with everyone’s prayers through this difficult time. It’s even more overwhelming to me the love and support I have received and continue to receive from my UST family. My mom thanks all of you at well. Please continue to pray for my mother and family. My thoughts and prayers with you,Party and all the family. Rest well cousin, until we meet again! Prayers of comfort for his family and friends. So sorry prayers for the family, I will really miss his smile and laugh, if I can do something let me know. A great man gone far too soon. I had the pleasure of working with and knowing Wayne for many years and while the loss is painful to me I know his family is the most devastated. My prayers are with you. Trust that in time God will ease the pain of your loss but your memories of a great husband, father, and friend will keep Wayne’s spirit alive in you forever. Our thoughts and prayers are with the Isabell family as they endure this hardship. May God give you strength as your loved one is welcomed into his Kingdom. Wayne was a man of integrity that cherished his family, he will be truly missed but never forgotten. I did not know Wayne personally but he raised a good son Rocky. May you be surrounded by family and friends during this difficult time. My thoughts and prayers going out to the Isabell family and friends. Wayne was a wonderful man to work with all those years prior to his retirement. May you all be surrounded with love and comfort during this most difficult time. He will be missed and thought of often. May you be at peace Wayne. I worked with Wayne for 27 years and I appreciated him very much.He was a good man.No more pain Amen !!!! Rocky I am so sorry to hear this. A sweet man taken so soon. I sure hope he did what he said he was going to do when he retired. I loved to listen to him tell how much he was going to enjoy a nice long smoke. I know you are going to miss him so much. Our prayers and thoughts are with you and your family.